Author: Mokeddem, Malika Set In . . .
What first appears as a tiny moving shadow, no bigger than a fly, on the dazzling horizon slowly reveals itself as the grim shape of violence and death; in the destruction left behind—the mother’s broken body, the hidden child, the crying infant—begins the story of wandering and loss, of exile and desolation that sounds all the sad echoes of disappearing Bedouin life. 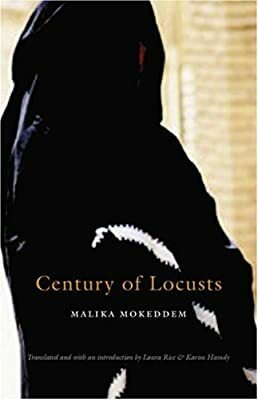 Set in the first half of the twentieth century, Malika Mokeddem’s Century of Locusts combines the magic of exquisitely wrought desert landscapes, the intrigue of Bedouin tales of madmen and poets, and the personal pain of exile and isolation to evoke a way of life destroyed by the scourge of settler colonialism. The book tells the braided tales of those left to resist: a wandering poet and his mute, stricken daughter, Yasmine; the lunatic Majnoun; and Majnoun's murderous sidekick, Hassan, who twitches and squints with malevolence, lurking along the story’s shadowy borders. Rippling ever outward with allusions and echoes, the tale eventually encompasses Algeria’s legendary past, its colonial injustices, and its uncertain future, even as Mokeddem’s poetry and deft touch confer life and hope on the ravaged body of this desert land.